Apple has become a giant in recent years and according to new study by Asymco’s Horace Dediu, Apple can purchase all the major vendors other than Samsung in cash. 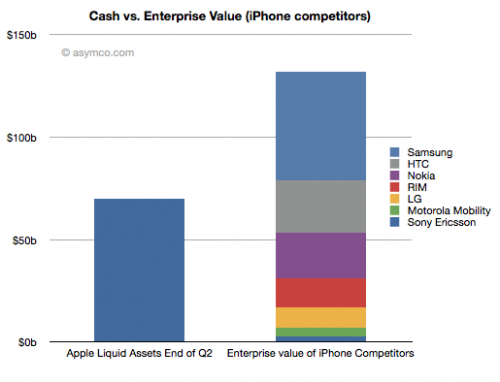 Experts expects that Apple has around $70 billion in cash, cash Equivalents, Short-term and long-term marketable securities. We also reported few days earlier that Apple needs around $1.3 billion to run iTunes which is almost half the price of Sony Ericsson net value of $3.0.